File Name: Jimmy (surname unknown) of Brazil. Date of Birth: February 12, 1966. Height: 6'2", Weight: 338 lbs. Note: In G.I. Joe's Street Fighter ads, the name rhymes with Tonka. 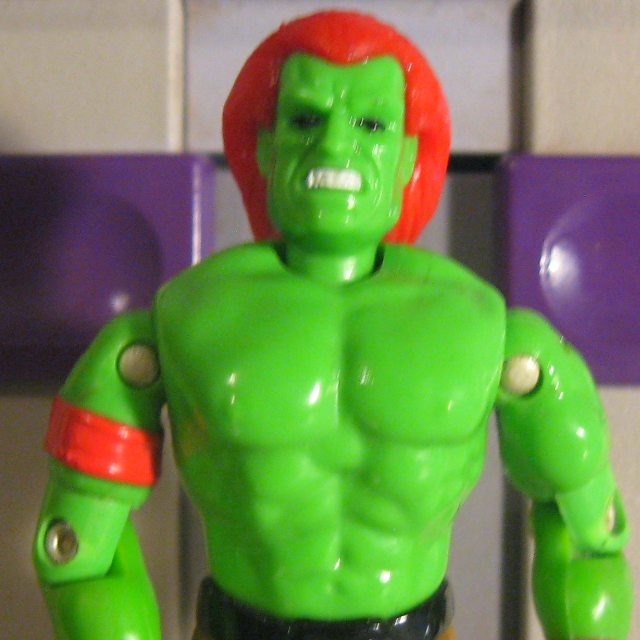 See this page for Blanka's depiction in the Street Fighter games, animation, and live action. Accessories: purple machine gun (92 Destro's), purple rifle (90 Rock-Viper's), orange spring missile launcher with black trigger (93 Astro Viper's), two purple spring missiles (93 Astro Viper's), black spring grappling hook on black string (93 Guile's), purple knife (88 Shockwave's), purple figure stand (common). Very little is known about this bizarre fighter from the jungles of Brazil. For years, the natives have reported seeing a half-man, half-beast roaming the rain forests. But, it was only within the last year, that the beast named Blanka appeared in the cities of Brazil and challenged any fighter who would dare oppose him. Normally passive and docile, when enraged Blanka attacks like an uncaged animal. Blanka uses his speed and agility to inflict maximum damage on his opponents. He often uses his claws and razor sharp teeth to shred his opponents into small pieces. Motto: "Seeing you in action is a joke!" Toy Notes: Featured in the Street Fighter commercial. Item #81083. Version 2: fall 1993 Capcom Street Fighter II boxed Beast Blaster vehicle. Toy Notes: Boxed with Chun Li and a recolor of the Dreadnok Thunder Machine. Item #8687.